Mystery Photo 33 asked readers for the name of the above vessel and her connection to Navy, which sank on 10 December 1993. The answer was ‘Kungah Maris‘, and she was a weapons recovery vessel based out of HMAS Creswell. She had an interesting story. The Kungah Maris was a 63ft, ex-RAF Air Sea Rescue vessel, built in 1959, by Groves on the Isle of White. She was acquired by the Department of Defence and transported to Australia as deck cargo on HMAS Melbourne, in 1977, on return from the Silver Jubilee Review. When off-loaded from Melbourne and lowered into the water at Sydney Harbour the wooden hull of the vessel was found to be leaking badly. The cure was to have it sheathed in a protective layer of fibreglass, which proved very effective – for a while, anyway. Below. The Kungah Maris in her original role and livery as a RAF Recovery Tender in the UK. Below. 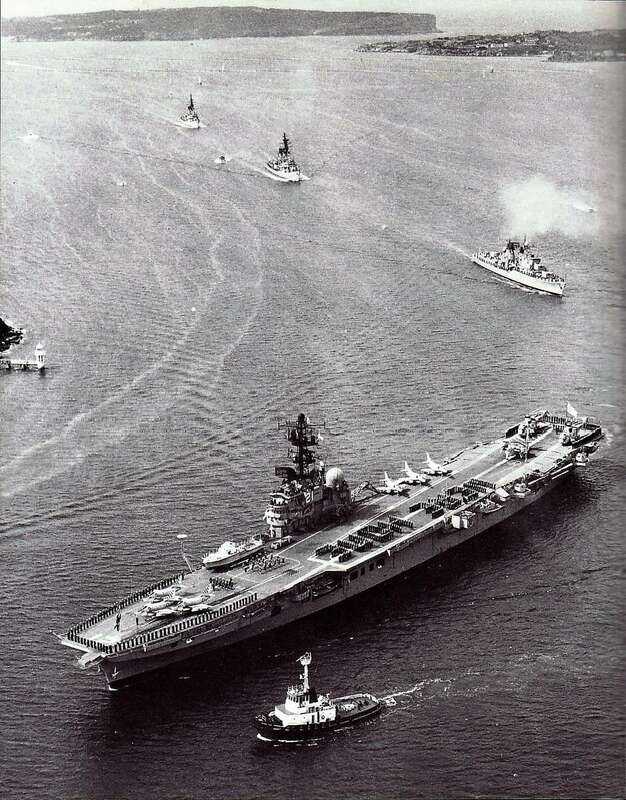 The Kungah Maris arriving in Sydney aboard HMAS Melbourne on return from the Spithead Review of 1977. Scott said, ‘from the time we started the pumps to the stage we realised the position was hopeless it was no more than 15-minutes. In the meantime we sent out a radio alert to the navy ships in the area saying that we were taking on water and we needed immediate assistance. Fortunately ‘HMAS Hobart’ was within a few kilometres and was able to reach us without too much delay. But it was an unnerving experience for the crew to be standing there with life vests on, with water washing over the deck and the prospects of a swim,’ said Scott. 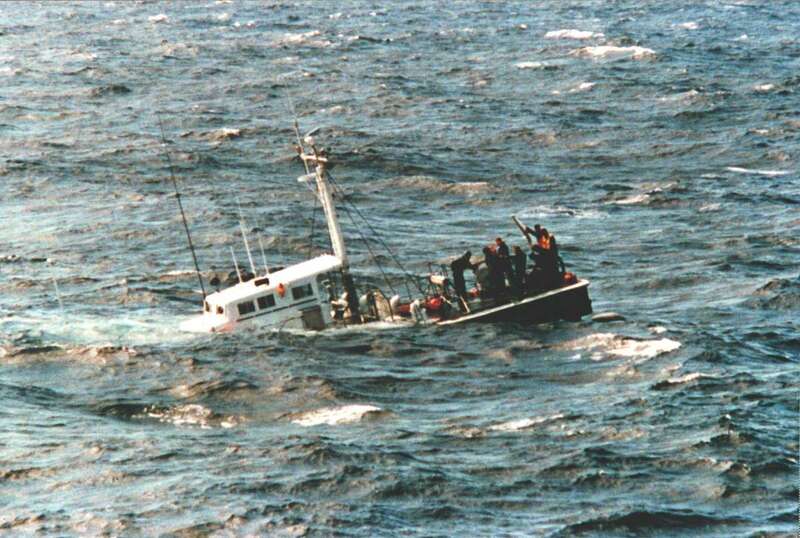 ‘After Hobart rescued us we witnessed a sorry sight as Kungah Maris slid beneath the waves into 1,400 metres of water. The crew of Hobart supplied us with warm, dry clothing and returned us to Jervis Bay. Unfortunately, there was no opportunity to discover the root cause of the sinking, although a Naval Board of Enquiry was held. The prime suspect has to be a collapse of part of the wooden hull covered by the fibreglass sheathing, preventing proper inspection of the hull’s condition’. Made seaworthy again Kungah Maris was based at HMAS Creswell on the South coast of NSW, from 1977 to 1993, where she was used for weapons recovery work during early trials with ‘Ikara’ (the anti-submarine missile) and with Grumman Tracker aircraft in anti-submarine exercises. In the later stages the majority of the work was acceptance testing and development of the BARRA sonobuoy in conjunction with the Sonobuoy Test Range on Bherwerre Ridge, Jervis Bay. And recovering sonobuoys dropped by RAAF aircraft during joint RAN-RAAF anti-submarine exercises. Also towing RAN surface targets for weapons practice serials – one of which had just been completed on the morning she sank – starting rumours Kungah Maris had been hit. Initially Kungah Maris was manned by RAN sailors and maintained at HMAS Creswell. However, in 1984, in a move to free-up sailors for other duties, tenders were call for the boat to be operated by civilian contractors. This highly successful arrangement operated for over 9-years and continues with the replacement vessel HMAS Kimbla, which took-on the name of Kimbla when she was decommissioned. Nowadays Kimbla operates with the civilian crew co-operating with the navy and air force in weapons recovery work during exercises off the NSW coast in the vicinity of Jervis Bay. 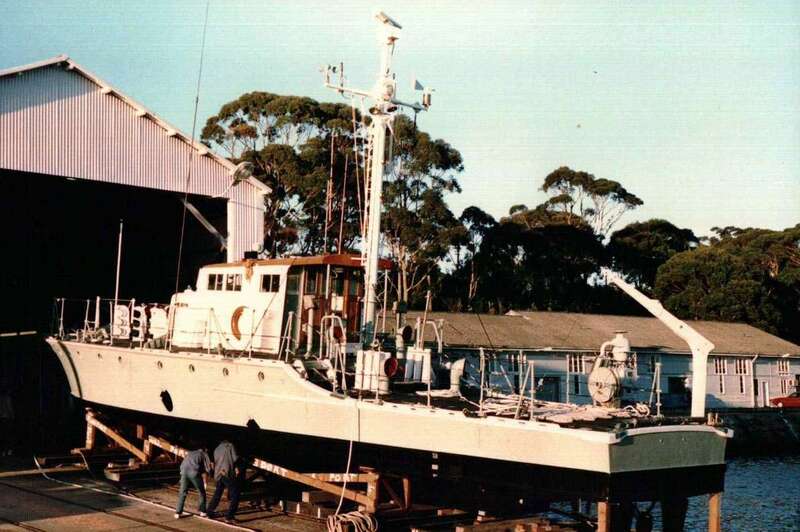 In the early 1990s Kungah Maris was hired by the CSIRO for environmental surveys of Jervis Bay when there was a possibility that the Fleet Base would be moved to Jervis Bay. Anyone who is familiar with the ocean in this part of the world – beyond the sheltered waters of Jervis Bay – will understand that Kungah Maris was generally operating in a sea state that, at best, would be classed moderate – and which could very quickly change to heavy. This placed constant strain on the vessel and a lot of pressure her crew in order to carry out the task required. Yet Kungah Maris continued in service for 16-years, until that fateful day on December 10, 1993 when she sank. Scott Corson was the Master of Kungah Maris on the day. He said: ‘We were returning to Jervis Bay after a surface target towing exercise with ‘HMAS Hobart, outside Jervis Bay, where conditions were fair with a moderate swell. It was about 7.00 o’clock when one of the crew decided to go below to make a cup of coffee, only to find several inches of water sloshing around the galley.’ He continued: ’ we quickly checked other compartments only to discover that flooding had spread throughout the vessel as there were no watertight bulkheads between compartments.’ Despite immediately starting the pumps, they could not cope with the inflow of sea water and Kungah Maris began to settle in the water. Below. The Kungah Maris on the slip at HMAS Creswell. After 16-years of solid service with the RAN (and who knows how many with the RAF) operating in seas that were hardly ideal for a vessel of that size, type and construction – Kungah Maris finally went to Davey Jones’s Locker. 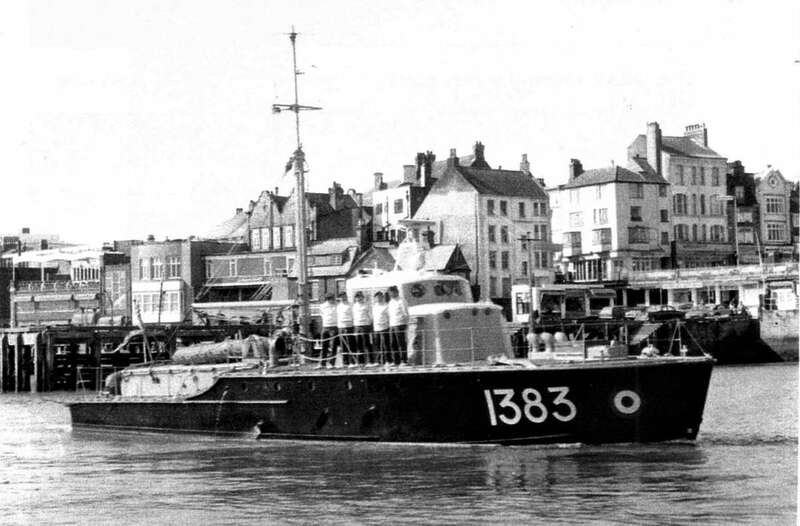 A sad ending for Kungah Maris – the ex-RAF ASR vessel No.1383 – yet she had a remarkable and varied 34-years in service.